TrackIt is an open source web-based project tracking tool, similar to Mercury Test Director or Alassian JIRA. Unlike JIRA and Test Director, TrackIt is free to use for any project. Trackit is built with the Echo2 Framework, taking full advantage of its AJAX based rendering engine. In this article we will provide a getting started tutorial guide for Trackit. TrackIt can be obtained in one of two versions, as a stand alone server application including an embedded web server (Jetty) and RDBMS (HSQL), or as a portal version, which is a war file ready to be deployed to any Servlet 2.3 specification compliant web container. 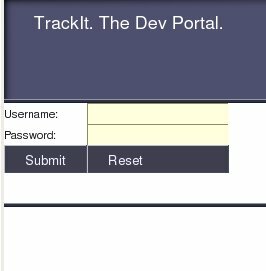 For testing purposes, the stand alone version is the easiest to set up, however for production use, the TrackIt developers recommend using the portal version. To keep things simple, we will use the stand alone version for this guide. For complete installation instructions see the TrackIt Installation guide. Enter the full name, user name and password for the new user, give him or her administrative rights and click on the "Save" button at the bottom of the screen. 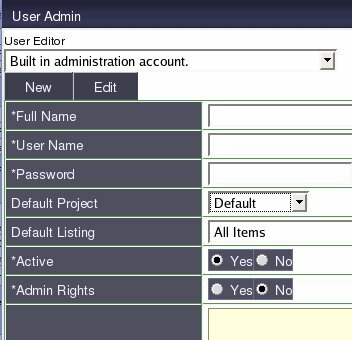 Close the user administration screen, log out and log in with the newly created user. TrackIt features optional CVS and Subversion integration, if you want to take advantage of this feature, the selected user name must match the user's CVS or Subversion user name.